The sn ow is melting and we're finally getting our hands in the dirt again! I'm really looking forward to the 2010 season... new crops and varieites, a full season with the chickens (along with some new ones), new CSA members (and returning ones as well), and the chance to apply the incredibly vast amount of knowledge we picked up last year during our first season of CSA. We're expanding significantly this year, not only to accommodate our growing CSA family but also to experiment with things like markets on the farm and selling to a few local restaurants. In taking on more commitments we knew we'd need more help and were lucky enough to get Julie, our work-for-share in 2009, for the 2010 season as a part-time grower and consultant. We're also taking on a few interns, which takes a bit of the pressure off my poor parents. A few weeks ago our 2010 seed orders started to roll in and my mom and I started the first flats last week... onions, brussels sprouts, kale, the first batch of chard, and some other early greens. They're already up! Below are our Red Marble onions and the Bright Lights chard - you can already see the red, pink and yellow in the stems. We'll be seeding flats indoors pretty regularly through the spring. We have a new shelf system set up in the basement with a heated germination chamber, and as soon as some of the cool weather crops are ready we'll rotate them out into cold frames and plant them in the field to make room for the later starts indoors. With the exception of our new strawberries, we start all of our plants from seed and doing everything in a small space is a bit of a challenge. 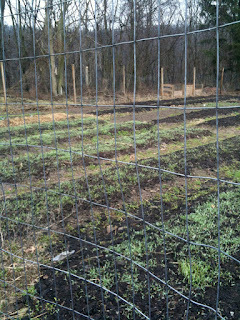 I'm hoping to get the snap peas in soon, but so much depends on the weather. After all the melting snow and rain this week we need to give the soil some time to dry out before working in it. There is something growing in the main produce garden though... the cover crop of winter rye we seeded late in the fall is getting started again in the raised beds where we'll transplant our heirloom tomatoes in late May. 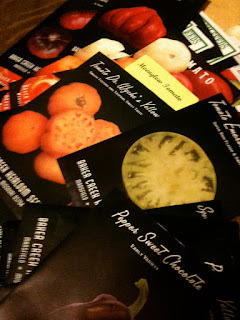 Keep checking the blog for updates as we get ready for the 2010 growing season.